The Bratch Winding Hole is a minor waterways place minor waterways place place on the waterways major waterways place village town city on the Staffordshire and Worcestershire Canal (Main Line: Stourton to Aldersley) between Wombourne Bridge No 43 (1 mile and ¼ furlongs and 1 lock to the southwest) and Aldersley Junction (Junction of the Staffordshire and Worcestershire Canal Main Line with the Birmingham Canal Navigations Main Line) (6 miles and 3¾ furlongs and 9 locks to the northeast). 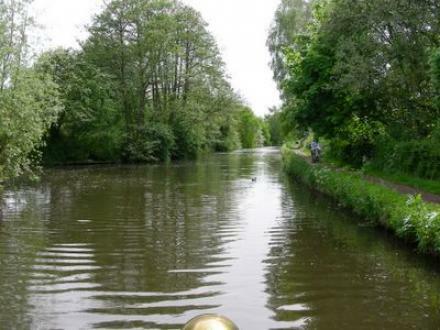 The nearest place in the direction of Wombourne Bridge No 43 is Bumblehole Lock No 22; 1¼ furlongs away. The nearest place in the direction of Aldersley Junction is Bratch Bridge No 47; 1¼ furlongs away. Kingswinford, WV5 9JB — 1037 yards to the southeast. Bridgnorth Rd., Wombourn — 1605 yards to the south. Unit 41 Wombourne Enterprise Park, Wolverhampton, WV50AL — 1156 yards to the southeast. 1620 yards to the south. 2 Lower Lanes Meadow, Wolverhampton, WV5 7HH — 1401 yards to the southwest. 100 Ounsdale Road, Wombourn, WV5 8 — 472 yards to the southwest. 34 Dingle Road, Wolverhampton, WV5 0EF — 1074 yards to the south. Wombourn — 1322 yards to the south. Best Road, Wolverhampton, WV14 6 — 1428 yards to the northwest. Smestow Bridge Industrial Estate, Bridgnorth Rd, Wolverhampton, WV5 8AY — 1549 yards to the southwest. Gravel Hill, Wombourn, WV5 9HA — 1169 yards to the southeast. 98 Ounsdale Road, Wombourn, WV5 8BP — 377 yards to the south. Wolverhampton — 1136 yards to the southeast. Church Rd, Wombourn, WV5 9EZ — 1150 yards to the southeast. Wolverhampton, WV5 — 1498 yards to the southwest. 11 Park Avenue, Wombourn, WV5 0ND — 1546 yards to the south. Wombourn — 1313 yards to the southeast. 69 Hazel Grove, Wolverhampton, WV59EG — 963 yards to the east. Wolverhampton — 1154 yards to the southeast. The Willows, Wolverhampton, WV5 9JB — 1424 yards to the south. Wolverhampton, WV4 4HP — 227 yards to the west. Wolverhampton — 1424 yards to the south. Wimborne — 264 yards to the west. Mojo towers, Wolverhampton, WV50DZ — 1192 yards to the south. Woodhill Drive, Wombourn, WV5 — 1157 yards to the south. 76 Lamb Crescent, Wombourn, WV5 0EB — 1090 yards to the south. Wombourn — 1327 yards to the south. Wolverhampton — 658 yards to the northeast. Wolverhampton, 07922413349 — 1485 yards to the southwest. Wolverhampton — 1461 yards to the south. Ounsdale Rd, Wolverhampton, WV58 — 464 yards to the south. Wolverhampton — 1579 yards to the south. Wolverhampton — 1537 yards to the southwest. Strathmore Crescent, Wombourn, WV5 9BD — 862 yards to the northeast. 39 Bratch Ln, Wolverhampton, WV 5 8 — 175 yards to the northwest. Fun World Rawalpindi: 2nd Floor Rania Mall, Bank road.Rawalpindi., Rawalpindi, 60000 — 1520 yards to the southwest. Wolverhampton — 1578 yards to the southwest. Ounsdale Rd, Wolverhampton, WV5 8 — 456 yards to the south. Wombourne, Wolverhampton, WV5 — 851 yards to the east. Unit E Smestow Bridge Industrial Estate, Wolverhampton — 1533 yards to the southwest. Smestow Bridge Industrial Estate, Bridgnorth Rd Unit E, Wombourn, WV5 8AY — 1561 yards to the southwest. 1520 yards to the southwest.